When you're raising a large family, it can be difficult to get everyone in one place at the same time. Plus, everyone has their own idea of what to do and, as we know, kids rarely agree. 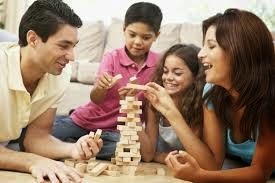 At least once a week, my husband and I try to pull all of the kids together for some quality family time. Here are some of our favorite ideas for quality family time. Family game night is a huge hit at my house, no matter if we are playing board games or card games. The kids love it and we love spending time with them playing, laughing, and having fun. Plus, it's also a great way to teach kids about winning, losing, and taking turns. In Spring and Summer, we love heading outdoors to take a walk or go for a hike. While we walk it's a great way to chat and catch up with the kids. Not to mention, the exercise is awesome. It's a peaceful and relaxing way to simply spend time together. Everyone loves home movie nights. We drag out our pillows and blankets and pop some popcorn while we all snuggle up in the living room to watch the latest movie. Arts, crafts, and even baking are a fun way to spend quality time with the family. Even my husband loves the art projects and decorating cookies with the kids. It lets the kids explore their creativity and often get a little messy. My family loves being outside, and no matter what we are doing out there, we always have fun. Whether we are kicking the soccer ball around, taking a bike ride, or just sitting out on the porch, heading outside is a great way to spend time with one another. What about your family? What are some ways your family enjoys quality family time?